Westchester Cub Scout Pack 73 is a year-round family program designed for boys in K through 5th grade. Our activities include the Pine Wood Derby, Camping, Food Drive, 4th of July Parade, Pool Party and more. 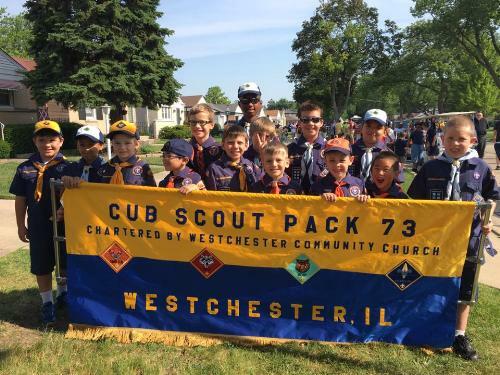 Cub Scout Pack 73 is chartered by the Westchester Community Church. Den Meetings are normally held the first two Tuesdays of each month in the basement of Westchester Community Church at 1840 Westchester Blvd. Pack Meetings are held monthly, usually the 4th Tuesday of each month. Parents must accompany boys to meetings and outings. When you’re a kid, fun comes first. Cub Scouts lets kids have fun while teaching them skills that will help them later on. From the thrill of camping to learning how to transform a block of wood into a race car, Cub Scouts is one thrill after another. With a program expertly tailored to match each age in a young child's life, Cub Scouts learn that even when fun isn’t easy, it’s always an adventure. In Scouting, everything has a purpose. And it shows kids that doing their best is the most fun of all. Current Kindergarten through 5th grade children and their parents are invited to join us for an open house to learn more about Pack 73, Westchester’s long-standing Cub Scout Pack. Pack 73 is open to all children regardless of which school or church you attend. Family Members are welcome to attend; at least one parent/guardian must attend. Scouting offers an opportunity for you and your son to experience fun with a purpose. Join us to find out how your son can participate in exciting adventures, learn important life skills and make lifelong friends. The Open House will feature fun crafts and activities including racing Pinewood Derby Cars.